For two years in a row the collectors pins used to raise funds for a variety of activities and celebrations at the annual Rondy Winter Festival were designed by Maria Talasz. The 2018 pins featured husky pups and the 2019 design reindeer in the "Running of the Reindeer" race held every year. This event raises money for the Marine's Toys for Tots and is one of the most popular events of the winter festivities around Rondy. Pin designs are selected in a competition format with a deadline in June of every year. The competition designs are a donation. Check out the official 2019 Rondy guide. Join us and take part in making history! The Mushing District project in Anchorage is a project centers around the celebration of the rich history of dog mushing in the State of Alaska and particularly of dog racing on Fourth Avenue in Anchorage. The project involves Maria's 3D art, graphic design and renderings by Maria through her work at Stantec. Contributions include: the dogs and musher profiles adorning the commemorative arch that marks the start of the Iditarod, the bronze pawprint and the husky profile disks that will be embedded in street furniture and sidewalks around the district. In addition Maria provides rendering support, ads, and brochure layout to promote the project. 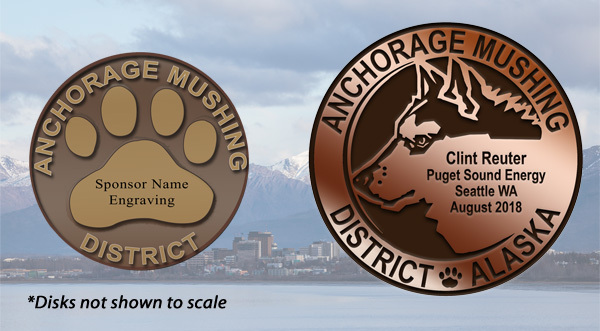 To help fund this project for instance offers solid bronze pawprints that can feature your name, or someone's name you gift a sponsorship to, engraved in bronze to be embedded in street furniture and pavement to permanently become part of Anchorage's street-scape celebrating Alaska's history! This amazing beautification project will be completely crowd funded and various options are available to get involved. Check out the website for more information. They range from bronze paw prints to adopting one of the dogs, be recognized in a profound way. This arch will be a backdrop where many visitors will snap a photo to share!